Note: This section requires content to the added in the Content section of the Page Header meta box. The Advanced section in the Page Header meta box allows us to merge our Page Header Content and our site header/navigation. 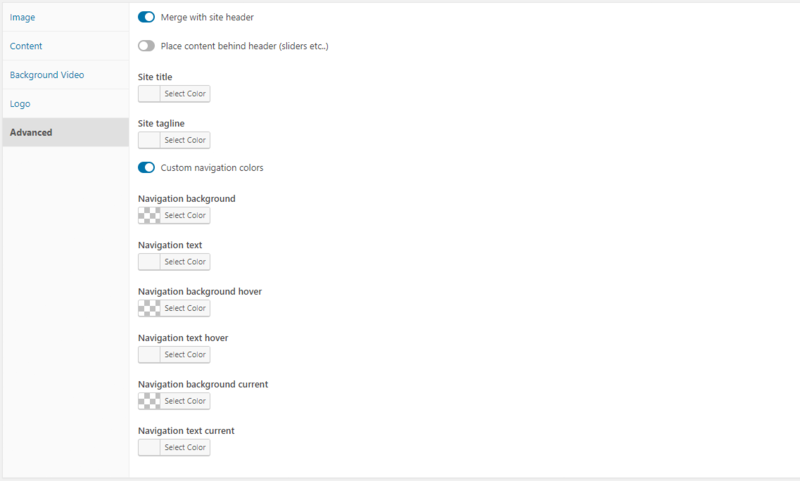 Enable the section by enabling the Merge with site header option. This option is useful if your page header background has been added to the Content section (a slider shortcode for example), and isn’t the default image or background video set in the meta box. Change your site title color. Change your site tagline color. Adjust the colors of your navigation so they match your page header. Enabling this option will make more options appear.